I don’t really hate the look of these Fleecing Cold Items. 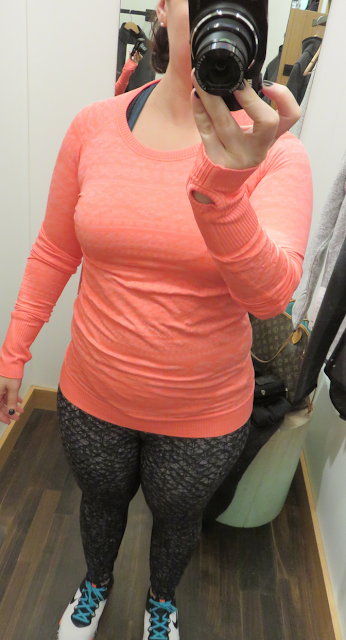 The remind me a lot of the Chaturanga Pullover which I love. 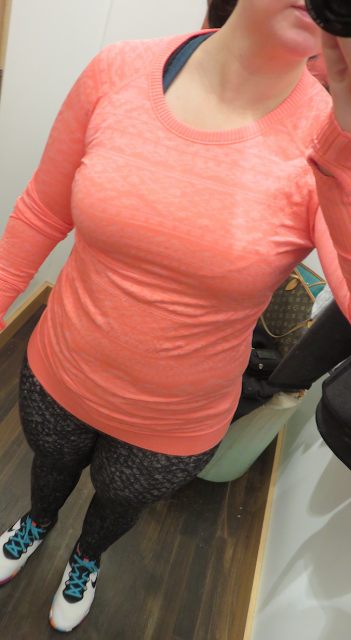 Unfortunately the material isn’t nearly as nice or worthy of my money like the Chaturanga Pullover was. Had this been lined in sherpa fleece instead of the thin polyestery fleece inside, I would have probably purchased the pullover. The jacket is on the short side on me in the front, and it is very a line and wide around the waist. If it had been longer I would have liked the proportions much better on me. The pullover is far nicer than the jacket in my opinion. It was nice and long and slouchy. If you have wide hips like me you will notice the hem has a binding tape that doesn’t stretch so it may catch slightly. 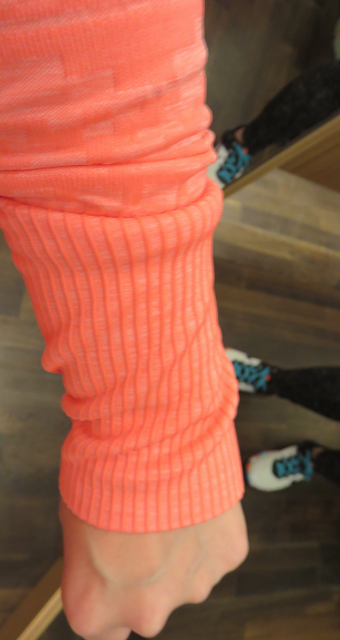 It was just right on me fit wise in the hips but any tighter and the pullover wouldn’t have sat right. I would consider this on markdown on boxing day if the price drops low enough. I LOVED this color. It’s such a different color for me and I didn’t expect to like it on since it’s so neon but it’s a really pretty and uplifting color. I may get this one. I’d probably size up though for more tummy room. The fairisle print on this and the grey ones are quite blocky and digitized in person so I didn’t care for it in the grey, but the color is the star on this pullover. *Make sure to check out with EBATES online (referral commissions are earned) and take advantage of the apple pay to get your $25 gift card. Don’t forget the holiday return period is now in effect. You’ve got until January 8th to make returns. I just don't understand why everything continues to be so short. It's not flattering, and the proportions are off even if you are short enough for these to be the right length. I know they probably just expect people to buy high waisted bottoms to go with their too-short tops, but that's not happening, either. The only differentiators about these pieces are the tiny LLL logo and the huge price tag. 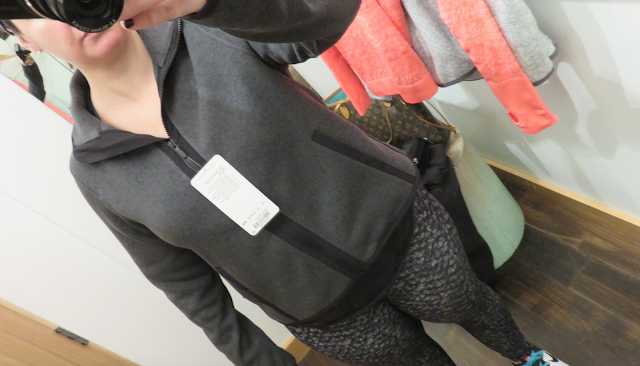 Target has cuter stuff for less, and real designers have much nicer pieces if you actually want to spend more serious money on "athleisure" (or just buy Patagonia, North Face, or whatever brand you like that has been making this stuff longer and better). It's weird that LLL doesn't get that items being recognizably LLL (without ever seeing the logo) is a big part of what made them successful. Yep. When I saw these photos I thought to myself that these look like Target or even Walmart. Nothing special or well-designed. Exactly anon 12:32! I'm short, so length isn't an issue for me but totally agree with everything said. This stuff is just (very) overpriced, mass produced made in China, generic stuff that can be found anywhere for less. Actually most of this stuff these days isn't only generic, but also very unisex/androgynous looking lacking femininity in fit, shape and design details – all the things I used to love LLL for and couldn't find anywhere else. I miss that LLL isn't even recognizable as LLL anymore – I couldn't care less about the logo on the clothes – it's all the special feminine details and designs and the feminine fit and shape (all while at same time being functional) that set LLL apart from the rest that matters, not the logo. Honestly my first thoughts on the jacket and the pullover were that they are both very generic and look like they could be from the men's section. The Fleecing Cold PO in particular looks incredibly generic in the grey. It looks like something you'd find in the markdown section at Walmart. The Fairisle prints of the Rest Less PO look cute though! 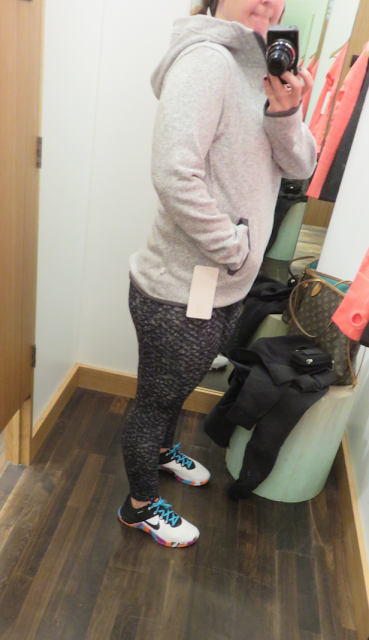 I tried on the fleecing cold jacket two nights ago and was shocked at how awful it is. Fit is all wrong and I have no discernible curves to speak of. My tts was like wearing a tent and the size down was too tight across the chest and arm pits with the remaining part still looking like a tent. The fabric was thin, scratchy and cheap looking. I also tried on the hill and valley mock neck, and while the Rulu was thick and lovely, the shoulders bunched up at the top and it would lay flat. Weird. 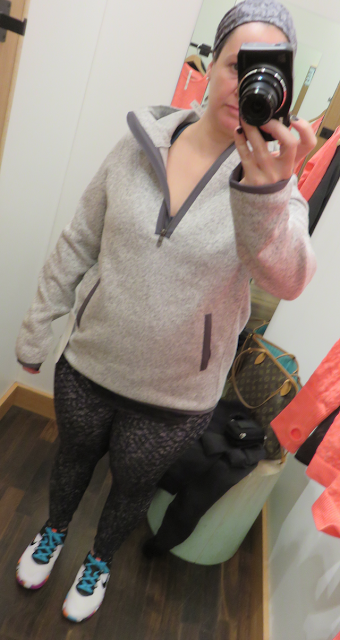 Didn't like the fleece pullover either. The kangaroo pockets in the front stick out, ( even in size down) and the outside fabric looks cheap. 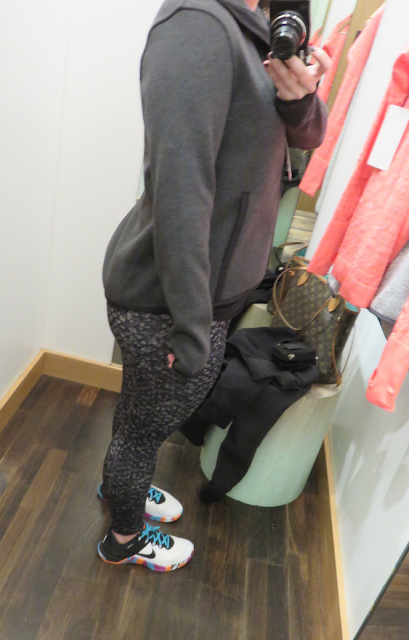 Which is too bad as I really liked the cross over part of the hoodie and the inside of it was soft and warm. 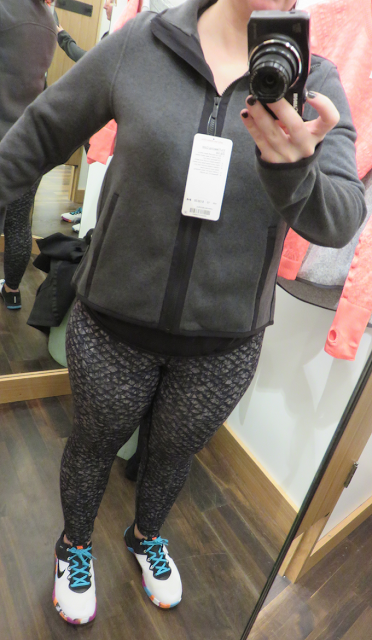 I scored though at Ivvia, and got both pairs of the galactic wanderer pants on black and grevvy in size 14, ( which is lulu size 4 or 6) They are amazing on, absolute perfection with great details. I also got the moon gem black criss cross sweater in merano wool. They have had some really good releases lately…. LLM do you wear a 10 in long sleeve swiftlys as well, or do you size up? Haven't been able to decide on a size to order for the restless pullover. I have swiftlies in both 10 and 12 and I prefer the 12's just for the extra baggy fit in the tummy area. The 10's are fine and I still wear them but I like a looser fit for gym workouts. I liked the Fleecing Cold PO best on you LLM but I agree with the other posts above that it is very generic looking and until this year I would never have dreamt this could be bought at LLL. You are a braver soul than me if you buy that neon coral Restless PO as I would never wear anything that bright but I could see it being a nice pop of colour under something. 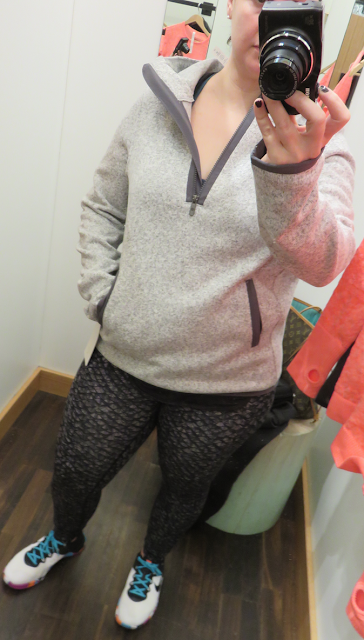 I returned the Restless 1/2 zip because I didn't like the feel of the fabric compared to my other Restless pullovers. I can't believe that up until this year I was spending thousands at LLL and couldn't wait for Tuesday uploads. What a bleak boring year of ho hum designs and all this black and grey is crazy. The US got a new rain jacket called The Rain Is Calling Jacket which only comes in black, as if we haven't had enough black jackets right? It's not water repellent but water resistant, there are no thumbholes or cuffins, no detachable or stowable hood and they are asking a whooping $198. for it. I guess this is the cheaper version to the black sleet jacket they have for $248. I am so not impressed with the direction this company is headed design wise. They have all but lost me as a customer who was ready and willing to spend thousands each year had they not discontinued my favourites and changed the overall look of what LLL was known for. Thanks Mr. Potdevin for nothing because that is what you are getting from my wallet. The rest less looks so pretty on you. I have one waiting in my cart, but some of color comments I've seen are scaring me off. How neon is the color? Super neon, like Flash? Or just bright like Pink Shell? It is very neon like Flash, but also more saturated. I find this one more flattering than flash on my skin. I bought two of the restless pullovers yesterday. Love the fit but didn't see this colour. It looks like you have the zip-up on in the first photo! They are very similar, but there is a jacket (which is much longer in length and has a two way zipper) and a zip-up, which is a little bit shorter and I believe that's the one you have on in the first photo! Hi! You have the It's Fleecing Cold Zip Up on in your try-on. There's a jacket version with more seaming on the front and it's a lot longer!